Our youngest members aged 5 to 7 are called Rainbows and follow the Rainbow Roundabout programme which is full of fun activities. 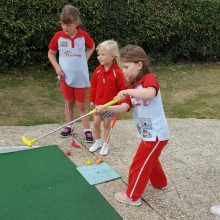 Rainbows is all about having the space to try new things and developing self-confidence, building friendships, learning new things and having fun. Girls get their hands dirty with arts and crafts, trying out cooking and playing games. Rainbows is all about learning and doing. To find out times and day of a local unit Please use the contact form. Please watch the media clip to see Rainbows in action.